The primary motivation for this Goldberg Variations recording seems to be a desire to save the work from the excesses of Glenn Gould, at least by proxy. A string trio arrangement of the work already exists. It is by Dmitry Sitkovetsky and was written in the wake of Gould's monumental first recording. In homage to the Canadian pianist, Sitkovetsky even goes as far as to transcribe the ornaments as they appear on the recording. 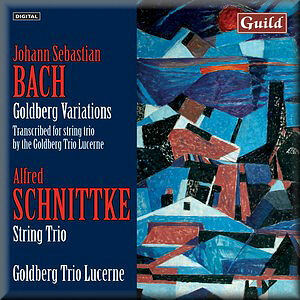 The Goldberg Trio Lucerne are understandably sceptical of the artistic value of this approach and have made their own arrangement. Where Sitkovetsky transcribes ornaments, they are more inclined to omit them altogether unless necessary. They are also committed to reducing doubling and what the liner-notes describes as 'octavations', presumably working on the assumption that Bach's contrapuntal textures are more than capable of standing up for themselves without any added textural support. The result is predictably ascetic, but the textures never seem undernourished, or indeed less than you could expect from a harpsichord. Despite their stated desire to move away from Gould, they share his approach of playing the aria without emotion so as to contrast it with the variations that follow. And each of the variations is played with its own distinctive identity and with a clear understanding of the genre to which each alludes. The slow movements are also played with a minimum of expression, and at slow tempos. The result is invariably both plaintive and elegant. The faster movements have real energy, although few are as fast as in Gould's recording. The Schnittke String Trio is a curious coupling. The composer has benefited a lot over the years from the assumption that his music can fit with standard repertoire works simply because it contains brief tonal or modal passages in the form of allusions to earlier works or styles. That only applies up to a point, I think, but you don't have to dig too far beneath the surface before spiritual links between the music of Bach and Schnittke begin to appear. The B-A-C-H monogram makes a number of appearances in the work too, suggesting further connections to the baroque composer, despite the overriding Romantic/Modernist aesthetic.